We evaluated hundreds of professional and customer reviews and spent more than a year hiking 1,500 miles to find the best backpacking stoves for the most people. After spending months reading the most popular reviews of backpacking stoves, we narrowed a list of the top 18 best backpacking stoves. From there, we chose 11 to test side-by-side on backpacking and camping trips in five states covering over 1,500 miles of trails. We think the best backpacking stoves should be easy to use, durable, and will serve you well in various conditions. We evaluated hiking cook stoves based on how easy they are to handle when hot and if they were small and ultralight enough to fit into a backpack. We think the MSR Pocket Rocket 2 is the best backpacking stove for solo travelers. The JetBoil MiniMo is the best hiking camp stove for those who want an All-In-One system. The Soto Windmaster is the best backpacking stove and upgrade pick for advanced users. The MSR Windmaster 1.8L is the best hiking camp stove for guides and group leaders. The MSR Pocket Rocket backpacking stove is a good balance of price, durability, and quality construction. A unanimous favorite of almost all the professional reviews we scanned, we think the MSR Pocket Rocket 2 is the best backpacking stove for most people. It was a favorite of customers and professionals alike because of its durability and straight-forward ease of use. We’ve carried the Pocket Rocket 2 for more than 100 days of dinners and morning coffee and continue to pack it on most of our trips. Almost every person who writes or edits for Treeline has bought and still uses this backpacking stove. Adventures in Stoving calls is “dead simple,” “beefy,” with a design where there is “nothing to go wrong with it” as well as “simple, strong, and reliable.” The Pocket Rocket 2 is a hassle-free, intuitive backpacking stove that doesn’t require babying, but still performs better than its competitors in most conditions. The MSR Pocket Rocket 2 is a durable and reliable hiking camp stove, while not feeling overbuilt. The Pocket Rocket 2 doesn’t have delicate parts that can snag or break off. It's simple design doesn’t have features that can break or get caught on things. Although it comes with a 1.0 oz plastic case, no one on our team has ever used the case. We stick the stove into our pot or sometimes just in our backpack’s mesh. While the manufacturer advises against either of these methods, we’ve never had an issue (though your mileage may vary) . The author using the MSR Pocket Rocket on the 1,200-mile Pacific Northwest Trail backpacking trip from Montana to the Pacific Ocean. Photo courtesy Naomi Hudetz. We found that the MSR Pocket Rocket 2 is among the most straightforward small backpacking stove to use (falling short only of the SnowPeak GigaPower). While all canister stoves are relatively easy to use once you get the hang of it, we’ve seen too many backpackers struggle with their stove system and opt not to eat because of it (read more on why we think ease-of-use is the most important feature when picking a stove). Eating is essential. We want a stove that is so intuitive, you can use it even if you’re too tired to put up your tent and were too lazy to read the directions before you left home. (Editor’s note: PLEASE read the instructions before you use any stove. Reading this article is not a substitute for the directions). What makes using the MSR Pocket Rocket 2 so easy to use is that the pot-stand arms go in two directions: up to hold a pot and down to stow away. The MSR Pocket Rocket’s arms don’t fold on themselves like the phalanges on your finger. This means fewer parts to break or get stuck. The Pocket Rocket was one of two stoves (the GigaPower being the other) that were this intuitive. It means fewer parts to confuse the spatially-challenged or those who have no interest in solving a 3-D puzzle to get their supper. Why do we like the simplicity of this stove? Sometimes after a big day in the outdoors, the brain and body are too tired to cook dinner. In our experience, that’s when we need dinner the most. Even after an exhausting day, we found the Pocket Rocket (and the SnowPeak GigaPower) so simple and unfinicky, there was no excuse to not boil water. The author with the MSR Pocket Rocket 2 in the Eastern Sierra. Photo courtesy Kate Hoch. When it comes to pot stand arms, there’s a fine line between super stable and arms so not-moving that they feel stuck in place. Stable arms won’t wobble if you accidentally brush against the pot or place the stove on less-than stable ground (don’t do this). But if the joints along the arms are too rigid or stick in place (like on the Optimus we tested), they can be frustrating to open and close, especially with cold numb hands. Even after accumulating several years’ of crud, the joints on my MSR Pocket Rocket stay in place without feeling like they’re stuck to the rivets. The Pocket Rocket 2 has pretty good simmer control. Adventures in Stoving and Outdoor Gear Lab found that they were able to hold food at just below a boil for extended periods by controlling the flame with a half turn of the control valve. Again, only the GigaPower was easier to use for simmering. Reviews are mixed about the Pocket Rocket’s pot supports. First, this stove (like, arguably, most canister stoves) is meant to hold a one-person pot. A lot of complaints are from people attempting to use a 2 L pot on this stove. Adventures in Stoving applauds the Pocket Rocket 2 for holding very small one person pots like Sierra Cups. But he also takes issue with the arms being sloped unlike the flat pot stand arms of the Windmaster (our Upgrade Pick). The MSR has among the best teeth on arms of the stoves we considered (though they’re better on our upgrade pick, the Windmaster). These teeth create additional contact between the arm and the pot. Close-up of the Pocket Rocket’s teethed arms. Photo courtesy Liz Thomas. Our main gripe with the Pocket Rocket 2—shared with professional reviewers and customer reviews alike—is that it doesn’t work well in the wind. We tested the Pocket Rocket 2 side-by-side next to our Upgrade Pick, the Soto Windmaster at Cathedral Pass (7800 feet) in the Pasayten Wilderness in northern Washington State in 30 mile per hour winds. Even when nestled behind a rock wall to protect against the wind, the MSR Pocket Rocket couldn’t boil the water (the Windmaster did it in 5 minutes—longer than usual, but still impressive given the conditions). Outdoor Gear Lab reported that it took them more than an hour to heat a cup of water on a windy mountainside in Colorado (and it never did get there all the way). On trips I’ve guided, some backpackers complain that the Pocket Rocket stove is too loud. While not as loud as some of other stoves we tested, the Pocket Rocket’s jet can block out conversation. If loud noises bother you, consider one of our other stoves. What put the PocketRocket ahead over the Snow Peak GigaPower, which was a very close runner up, is MSR’s longstanding reputation of having a very fair return and repair policy. That’s not to say we don’t trust SnowPeak’s warranty, which looks equally good. We just have fewer datapoints to corroborate its quality, but are looking forward to following up on the future. In addition, the Pocket Rocket is slightly lighter in weight and faster at boiling water. The Pocket Rocket 2 at a campsite that has been “snorked-up.” Photo courtesy Kate Hoch. According to manufacturer specs and tests by Adventures in Stoving and Outdoor Gear Lab, the MSR Pocket Rocket isn’t the most efficient stove. It also isn’t the lightest or the fastest cooker. But it performs above average on all the specs we care about while also being the easiest to use and the most durable. We at Treeline Review want to recommend a single stove that you will love and can pass onto your grandkids. The MSR Pocket Rocket2 is just that. The Soto Windmaster on a section of the Boundary Trail in eastern Washington in 2018. Photo by Liz Thomas. If you’re willing to pay more for a backpacking stove, we recommend the Soto Windmaster because it is the lightest, most versatile, most wind-resistant stove we tested. Even when you’re out of the wind, there’s a lot to love about the Soto, which won the American Alpine Institute Guide’s Choice Award. The durable and well-made Windmaster has a sturdy, flat pot stand with teeth that grip the bottom of your pot. It can accomodate solo or group-sized pots, making it versatile for different trips. But it isn’t our overall recommendation because it has a steeper learning curve to use than other stoves. We think the Soto Windmaster is an excellent choice for someone who plans to use their stove a lot and is willing to practice the set-up at home before going on a trip. As advertised, the Soto Windmaster was the best of the stoves we tested for boiling water in the wind, managing to give us hot water in 5 minutes in 30 mile per hour winds (vs. the MSR Pocket Rocket 2, which performed so poorly, we gave up and drank lukewarm coffee). The way it works is that the burner head is recessed--it’s shaped in a concave manner that pushes heat up. This is in contrast to the drastically convex-shaped open burner head like on the Optimus Crux Lite that we tested. Close-up on the Soto Windmaster’s flame. Photo by Liz Thomas. Like its award-winning and earlier-model cousin, the Soto MicroRegulator, the Windmaster has a regulator that’s considered among the best in the industry. The regulator means that the Windmaster regulates the pressure of the gas release from your canister, so it can work better in cooler temperatures than stoves without regulators (see the criteria for more on regulators). Both the Windmaster and the MicroRegulator are capable of cooking at 11,000 BTUs (aka 2800 kcal/h 3260w 11000 BTU), significantly hotter (and thus faster) than most of the stoves we considered. While we often find that ignitions fail on upright canister stoves, Soto’s is considered among the best in the industry due to its protected design (it doesn’t leave out any hanging parts that can catch, become loose, or fill with trail gunk). Still, a separate ignition is one of the Ten Essentials, so we’ll still keep carrying our Mini Bic lighter. Treeline Review co-founder Naomi Hudetz and the Windmaster on Cathedral Pass in the Pasayten Wilderness, WA. Photo by Liz Thomas. The major upside--and downside--- of the Windmaster is that it comes with a detachable pot support. First, the downside: To use the Windmaster stove, you need to snap on the pot support, which takes some spatial skills. As someone with poor spatial skills, I generally don’t like gear that requires assembly in the field. At the end of a long day, I have no desire to assemble a 3D puzzle of a stove. It just taxes what little mental energy I have left. I’m also generally not a fan of items with moving parts. To me, that just means more parts to break or misplace. Adventures with Stoving recommends linking your detachable pot stand to your pot via a micro-carabiner to prevent against losing that part (it’s unfortunately a brownish color that blends in well with dirt). The upside of the detachable pot support is that it makes the Windmaster one of the most versatile stoves around. You can use it on small solo pots or convert it to hold 2L pots for group trips. This makes it a good value for people not stymied by learning the set-up. The testing spot on Cathedral Pass was protected by a natural wind barrier (the rock). However, while the MSR Pocket Rocket had trouble boiling water, the Windmaster had no problem cooking up a boiling cup. Photo by Liz Thomas. We recommend the Windmaster for those who have had some experience with canisters stoves or new owners who are willing to put in the time to practice set-up at home before heading in the field. Really, we suggest everyone practice with their stove--whatever the stove you own--before taking it into the field. But the Windmaster, despite its learning curve, will not disappoint those willing to put in some extra time. The JetBoil MiniMo comes with full handles and a squat pot that fits into backpacks better than most integrated stoves. Photo courtesy Liz Thomas. The JetBoil MiniMo is the best integrated stove for a solo-cooker that we considered and a favorite of almost all the professional reviews we analyzed. With the MiniMo, Jetboil builds on the easy-to-use design of their original Flash system and created an all-in-one stove (minus fuel) that is relatively lightweight, very fast, fuel efficient, and space efficient. The Jetboil MiniMo comes with a pot, igniter, and the stove, so if you get this system, you don’t need anything else, which makes it a convenient system for those who aren’t sure what they want. What we liked about this Jetboil is that it fits better into the front mesh of a backpack than other integrated stoves (meaning making a quick hot lunch is easy). The Minimo is also less tippy and more stable than the JetBoil Flash, while also being easier to disassemble and clean than other stove systems. The main drawback on this Jetboil stove is its price and how it fares in wind (though it performs similarly to our main pick, the MSR Pocket Rocket). Close-up of the MiniMo’s components and handles taken at a campground in Joshua Tree National Park. Photo courtesy Liz Thomas. What we liked most about the Jetboil MiniMo is that it is less bulky than other integrated stove systems. It fits inside the mesh in a backpack almost as well as a canister stove+pot system. But because the Jetboil MiniMo has a quick and easy boil, it’s reasonable to make hot drinks all day long. 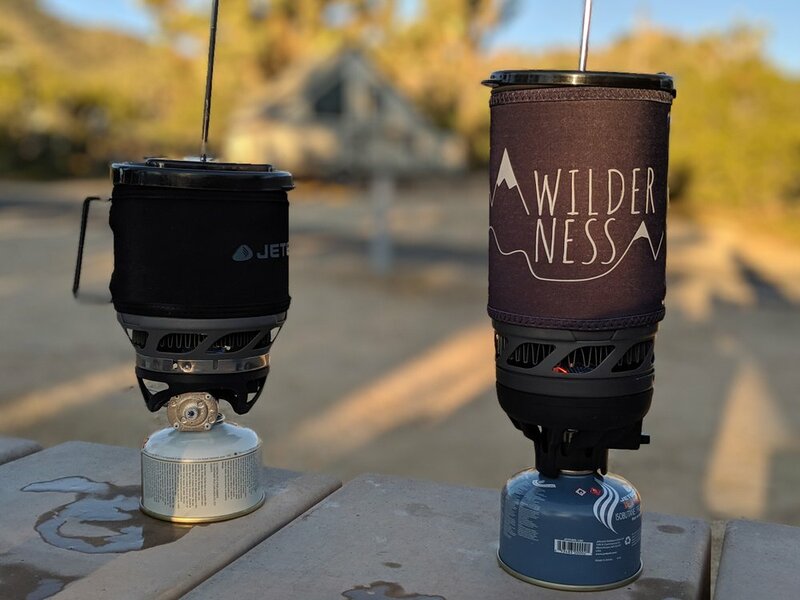 Treeline senior editor Brandon Lampley finds this the most exciting part of the Jetboil MiniMo system: “To me, the major benefit of carrying the stove in an outside pocket...is hot drinks or hot lunch on the go. Plus, quick hot drink as soon as you stop to camp.” When backpacking in cooler weather like a late spring or late fall hike, that quick hot drink during breaks or a hot lunch can be a morale booster and motivator to push on. Close-up on the small gap in the insulation cover on the MiniMo. Photo courtesy Liz Thomas. While every backpacker packs their backpack in different ways, integrated stove systems often take up valuable pack real estate in a water bottle pocket or hang awkwardly on the top of the pack, where a dirty or wet pot can mess with your other gear. With the Jetboil MiniMo, the bottom screws off easily (although it could be easier) and fits inside the pot along with a sideways-oriented fuel canister. The MiniMo’s system is a far more efficient use of space than the other integrated systems. 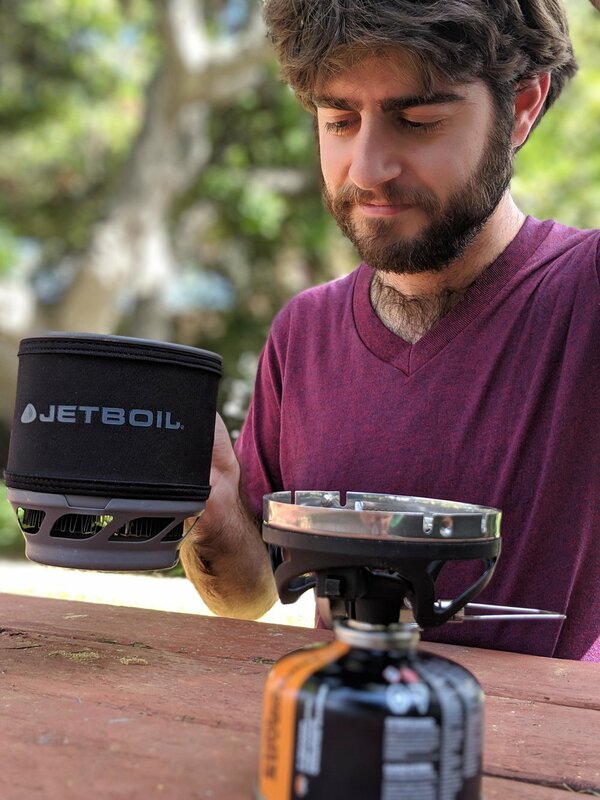 With the Jetboil MiniMo, your pot will protect your stove from getting clogged with dirt and from metal parts from your stove potentially damaging soft goods gear. (Although, compared to the arm supports and leg supports found on other stoves, the MiniMo system has the least sharp edges of the stoves we tested). Part of what makes the Jetboil MiniMo the best backpacking stove is its shape: a squat size 1 L pot vs. the more traditional “beer mug” shape of the JetBoil Flash or MSRs we tested. Coils underneath give it a quick boil time. Outdoor Gear Lab found that the MiniMo has a relatively fuel efficient system and speedy boil time (4:06 to boil a L; the second fastest of those we tested after the Jetboil Flash). But that squat height also means it’s also quite stable. That short-sized pot also means the Jetboil MiniMo doubles nicely as a bowl--one that doesn’t require a long-handled spoon! The Jetboil Flash (left) and MiniMo (right) in coffee mode. Photo courtesy Liz Thomas. The Jetboil MiniMo also has some thoughtful additions that make use easier. Unlike the other stoves we tested, it has actual metal pot handles with rubber insulation (so they don’t feel hot--though some customers complain that the joints can burn you). We much prefer MiniMo’s system to the fabric insulated coozy sleeves on Jetboil’s other stoves, which can melt or otherwise be difficult to get your hand in just right (at least in the dark). Customer reviewers and our own testers found the the MiniMo could use more insulation adjacent to the handles. While the handles are solid and cool, if you accidentally touch the pot near the handles, that area can burn you if hot. The MiniMo also lacks the side panel indicator found on the JetBoil Flash (it turns red to let you know the water has boiled). The Jetboil Flash has a temperature-changing indicator on its sleeve that goes from blue to red when the water is boiling hot. Photo courtesy Liz Thomas. An annoying feature of the Jetboil MiniMo and many other integrated stoves is that there’s no easy way to remove the pot from the canister when there’s hot liquid inside. Read the manual for more on this. Customer reviewers and our own testers found that the system seems to lock down when hot. You have to pour water from your pot with the canister still attached like some especially long carafe. But still, the cooled MiniMo system was vastly easier to disassemble for cleaning or eating than the JetBoil Flash. Our testers also thought the pour spout that comes with the lid could be better angled and more generous, but honestly, we recognize any pot lid with a pour spout is pretty amazing. Unsurprisingly, Outdoor Gear Lab dinged it for not being great at simmering (though they still thought it was the best of the integrated systems). We tried real-real cooking with the add-on pot supportthat allows your Jetboil MiniMo to work with non-JetBoil pots and pans. The converter piece has a lot of sharp edges that need to be hooked into the burner to work as a stable pot support. Knowing that everything had to be snapped in just right to not create an unstable situation over a really powerful JetBoil burner made the process intimidating, although it gets somewhat easier with practice. Customer reviewers also complained that because the bottom of the pot isn’t non-stick, it’s hard to clean food that has been real-cooked in there. The MiniMo and Flash in French press mode at a campground in Joshua Tree National Park. Photo by Liz Thomas. 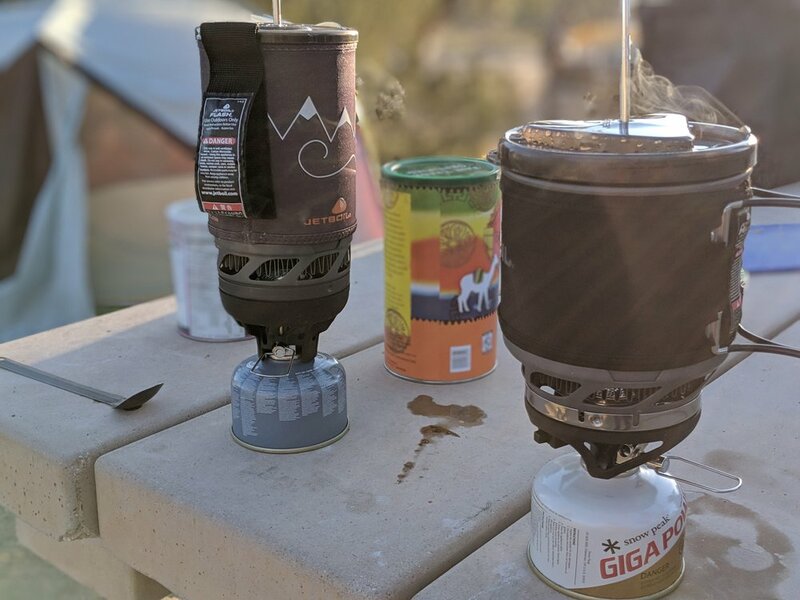 The Jetboil MiniMo (and the Jetboil Flash) have add-on French Press components that felt luxurious while car camping and minimal enough that I could’ve seen myself carrying one on a plush backpacking trip. The French Press Kit adds 1.05 oz to the MiniMo. The Jetboil MiniMo is a great pick for someone who wants a quick, easy, and simple system. It’s among the highest rated of stoves on REI (4.4/5 stars over 114 reviews) and Amazon (4.5/5 stars over 101 reviews) and the best integrated stove according to Outdoor Gear Lab. Hands down the most common complaint among angry reviewers is that Jetboil’s piezo stopped auto-igniting. We know this happens to every stove and suggest whatever stove you have, to bring your an extra lighter and never expect much of a piezo. Unlike on some systems, the piezo on the Jetboil MiniMo isn’t easy to fix. 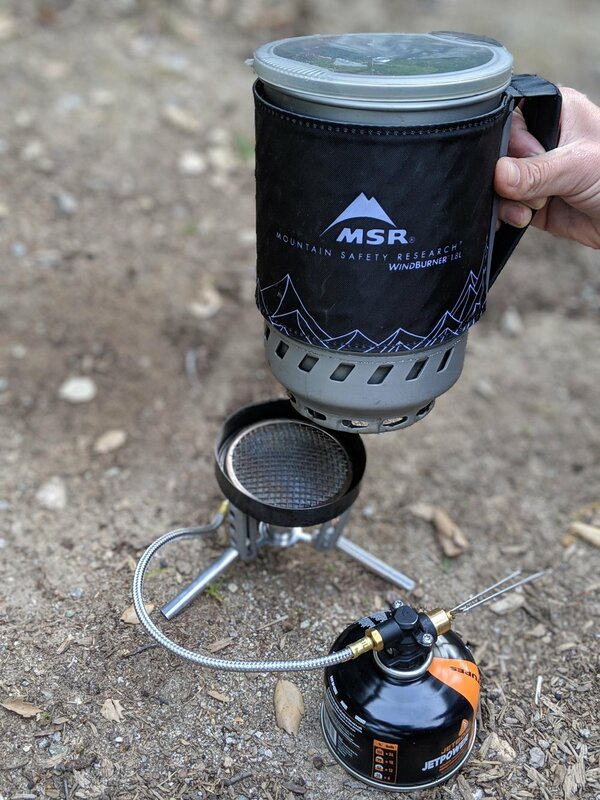 The MSR Windburner 1.8 L is great for situations when you’re in charge of cooking for a lot of people and want a quick system that is windproof and simple to use. The Windburner shows up as a highly-recommended stove on almost every professional review we considered. But it’s extra price, bulk, and weight make it best for situations where you really need a stove of this caliber: when you’re in charge of scouts, a group of friends you’re taking outdoors, or clients you’re guiding. As you can imagine from its name, the Windburner’s major perk is that it can still function in high winds. By reducing the effect of winds, theoretically it burns more efficiently and boils faster. This makes it one of science’s great gifts to those in charge of groups who are cold, hungry, and need a morale boost in the form of hot foot. However, without wind, according to Outdoor Gear Lab’s data, it’s one of the slower burners (despite what they say about it being fuel efficient). Oddly, in our personal tests, it always seemed to burn faster than the MSR Pocket Rocket. Adventures in Stoving liked the MSR 1.8 L Windburner over the similarly-sized option available from JetBoil, although he finds the weight hard to justify if you don’t see wind in your future. The Windburner is a fairly intuitive system. Unfold the legs, plop the stove on the burner, and screw the canister into the end of the satellite piping system. That’s right. Unlike the other stoves we considered, the fuel canister is attached via a satellite system. This cuts down on the system’s height (it’s already the tallest we considered) and makes it more stable. While some reviewers complained that the pot doesn’t screw in securely to the base, we liked that feature. It made it much easier than the MiniMo to handle while hot (though it still must be done with care). Both the Windburner 1.8 L and the Windburner 1 L pot fit onto the Windburner base. Photo courtesy Liz Thomas. While guiding in Big Sur in the pouring rain in February, I kept the Windburner going constantly to supply folks with morale-boosting hot tea and a too-salty soup. Another huge advantage of the Windburner 1.8 L is that you can use the same stove base for the 1 L Windburner cookpot. The 1 L cookpot plops onto the Windburner’s base just as well as the giant 1.8 L pot. This means you can convert your group system to a solo or couple’s system without having to buy a whole new integrated stove. 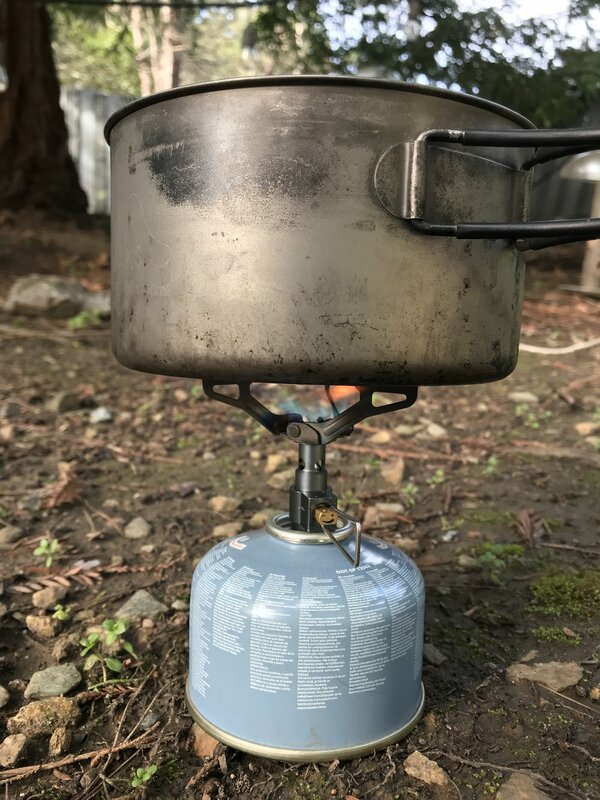 The 1 L Windburner cookpot is 2/3rds the price of all the least expensive integrated systems we considered, so choosing the 1L accessory pot offers some cost savings if you’re ok with the weight. Close-up of the robust burner on the Windburner. Photo courtesy Liz Thomas. There’s a few things to quibble about on its design. There’s no way to beat around the bush. The Windburner is bulky and heavy. It’s hard to find a spot that the 1.8 L system will fit on a backpacking setup. We don’t like (and professional reviews agree) that the handle is made of fabric. It’s hard to get a gloved hand into the right spot when doing it in the dark. Also, the fabric can melt (we know from experience). But compared to the MSR Whisperlite--for years the “group stove of choice”--the Windburner 1.8 L is dead simple. It’s not a gourmet cooker. It doesn’t have much temperature control. But when you need hot water for a big group in inclement weather, it can do that job and quick. The Jetboil Flash tested in Joshua Tree National Park. Photo courtesy Liz Thomas. The SnowPeak GigaPower is arguably the easiest to use stove and is the best pick for temperature control for those who want to do gourmet cooking in the backcountry. Its design is like a work of art and it is much loved by professional reviewers. The GigaPower is also incredibly durable. But compared to the MSR Pocket Rocket 2, it has extra weight, bulk, and a slower boil time. We think most backpackers wouldn't be bothered if one of those stats were true, but all three pushed it down in rankings for us. We also couldn’t find much data on SnowPeak’s customer service, whereas we have lots of data on MSR’s good customer service. The two company’s customer service plans look similar, it’s just SnowPeak hasn’t had as long of a U.S presence as MSR. We look forward to collecting more data and reporting back. The SnowPeak LiteMax tested on a section of the Boundary Trail in the Pasayten Wilderness. Photo courtesy Liz Thomas. The LiteMax is a well-designed, lightweight, and very compact stove has arms that unfold like a piece of Origami. Thus, its beauty (and what makes it so well-beloved by Switchback Travel, Outdoor Gear Lab, Sectionhiker, and Greenbelly) is also its downfall. We don’t think that a stove that requires that much folding is a good first stove.The Snow Peak LiteMax is a great stove for the type of people who like to nerd out about stove specs. But if you’re simply looking for something easy and simple to cook your food on, we think the LiteMax’s bulkier brother, the GigaPower, will serve you better. The Snow Peak GigaPower tested near an eastern Sierra hot spring on a chilly November morning. Photo courtesy Liz Thomas. 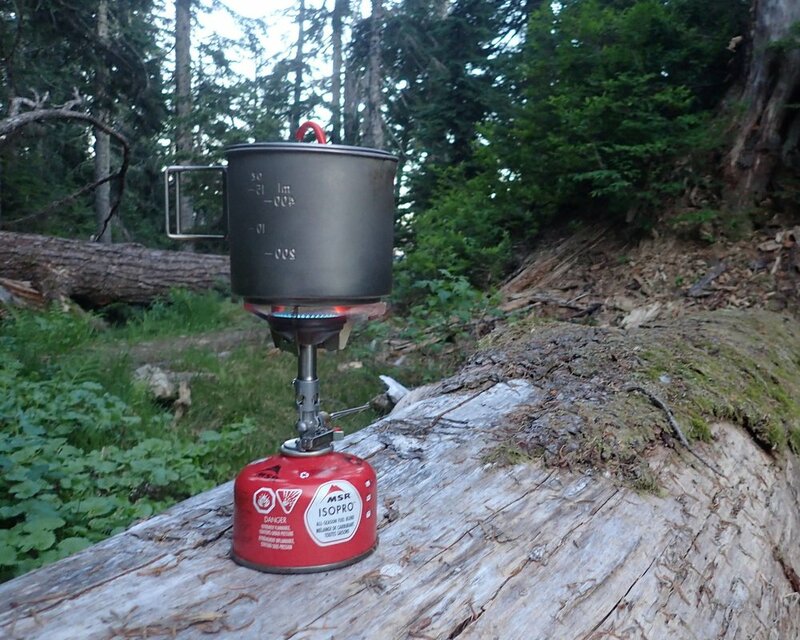 We took the compact Optimus Crux backpacking stove for 1,200 miles of backpacking on the Pacific Northwest Trail. Rated at 10,200 BTUs, it’s notably quicker at cooking than the MSR Pocket Rocket 2, but is less fuel efficient. In our tests, it’s concave design also makes it less wind-resistant than our upgrade pick, the Soto Windmaster (and even less wind-friendly stoves like the SnowPeak LiteMax). Additionally, in a series of stability tests by Adventures in Stovin’, the Crux didn’t fare as well as the Pocket Rocket. That’s consistent with our experience in the field. The joints on the Crux’s pot support arms perpetually feel stuck, requiring yoinking to get open (and pushing to close). The Optimus Crux is a solid choice and has been trusted for many years, and while we don’t think you can go wrong with it, the Pocket Rocket meets our criteria better. We like that the Jetboil Flash glows red to alert you that the water is boiling. Photo taken at a campground in Joshua Tree National Park. Photo courtesy Liz Thomas. The relatively inexpensive Jetboil Flash used to be considered the gold standard for integrated stoves, though we think Jetboil offers better technology with their MiniMo. The Flash is the best backpacking stove for boiling water quickly. But the Jetboil Flash’s beer-mug shape makes it bulky, difficult to eat from, and less stable. The Jetboil pot also snaps into the stove a little too well. Removing it for cleaning or getting to fit into a pack better was frustrating. While the Jetboil Flash is the less expensive cousin of the Jetboil MiniMo, we think the MiniMo will fit better into most people’s backpacking lifestyle. One perk of the JetBoil Flash is that it’s available as a Jet Boil Flash Java Kit. This turns your Jetboil into a lightweight French Press that works so well, we use it to make coffee at home (no joke). Jetboil’s coffee kit adds 0.8 oz of weight by our scales. If you already have the Flash, you can convert your system the Jetboil French Press accessory kit. While the Jetboil MiniMo is available with a French Press addition, the classic Jetboil Flash shape is more reminiscent of a traditional French Press. We’re convinced the Jetboil Flash Java Kit makes a better cup of joe. Windburner 1 L is an excellent stove with all the benefits of our best stove for groups, the Windburner 1.8 L. In fact, only the pot size is different. While we were happy to take on the Windburner’s bulk and weight when we cook for a group, we dismissed the 1L Windburner as being too heavy and bulky for a solo integrated stove system. However, if you own the Windburner 1.8 L anyway, we highly recommend the MSR Windburner 1 L cookpot. Why? Because you can use the same stove base as the 1.8 L Windburner, effectively giving yourself the full Windburner 1 L set up. This gives you two stoves in one! Plus, MSR also makes a French Press conversion for the 1 L Windburner cookpot (sadly, not available for the 1.8 L cookpot...but that would be a really big cup of coffee). The BRS 3000T is an ultralight backpacking stove with many positive reviews including from our friend Scott “Shroomer” Williams, whose set-up is shown here. It has traveled thousands of miles with him on numerous backpacking trips domestically and internationally. Photo courtesy Scott Williams. For a fraction of the cost of the other stoves, the Haman’s BRS ultralight backpacking stove is among the most loved stoves among customer reviewers and professionals. It scores a 4.5/5 stars of about 200 reviewers on Amazon and is recommended as the best budget stove by Sectionhiker, Fresh Off the Grid, and Outdoor Pursuits. Several Treeline Review writers and editors have bought and used this stove and have found it a good bang for the buck. But we found the BRS has a flaw: it can’t operate at full power lest it melt the arms of the stove. If you’re ok buying a stove that you probably can only operate at 75% power (which we found to be plenty powerful to boil water and simmer food), the BRS is a lightweight stove that is easy to use and inexpensive. Customer reviews also mention the stove exploding or having other safety hazards at a rate that is just too high a risk for us to recommend. This contender for budget stove is bulky and heavy with what looks like way too many arms and parts to get the job done. The Etkcity arms didn’t feel steady (see video in the “support and stability” section to get an idea what we mean). The pizzo was tucked away in a spot that felt scary to press knowing that it would spark a fire right by your finger. Despite reduced efficiency and not working in the wind, the Etkcity is a favorite budget stove of Outdoor Gear Lab and Section Hiker and #1 on Amazon. But we think you’re better off paying more for a durable stove that you’ll love and will last. If money really is an issue, the SnowPeak Giga in Manual (which is about $10 less expensive than the Auto version we tested) is a solid bet that you’ll love so much, you’ll pass it on to your grandkids. I’ve backpacked over 18,000 miles and have at least 900 nights sleeping outdoors. On most of these overnight trips, I’ve cooked dinner on backpacking stoves. When I wake up in the morning in the backcountry, I’ll boil up some hot coffee. On chilly days, I’ll make hot lunch. In addition to using stoves extensively for the past decade, I’ve written about outdoor gear for numerous publications including Backpacker and the New York Times’ product review site, Wirecutter. I’m the author of the National Outdoor Book Award winning Long Trails Mastering the Art of the Thru-hike. My book has extensive gear and nutrition chapters--both of which address different kind of backpacking stoves. I regularly book speaking gigs with outdoor clubs, non-profits, and colleges and universities to talk about backpacking and lead gear panels. I’m also Editor-in-Chief here at Treeline Review and oversee all of our outdoor gear stories. 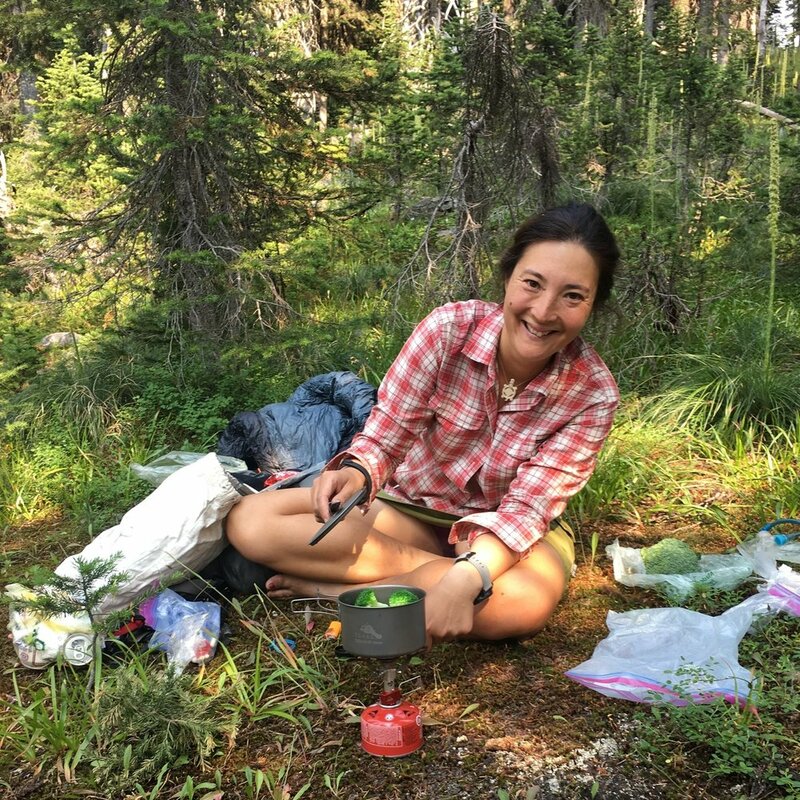 To figure out what is important in a backpacking cooking stove, we researched professional and customer reviews from Clever Hiker, Outdoor Gear Lab, Switchback Travel, Greenbelly, Adventure Junkies, Fresh Off the Grid, Section Hiker, and Outdoor Pursuits. We also analyzed reviews from the backpacking stove specific website Adventures in Stoving. Lastly, we evaluated customer reviews from REI, Backcountry, Moosejaw, and Amazon and identified the most popular stoves at each of those retailers. See our sources for more details. 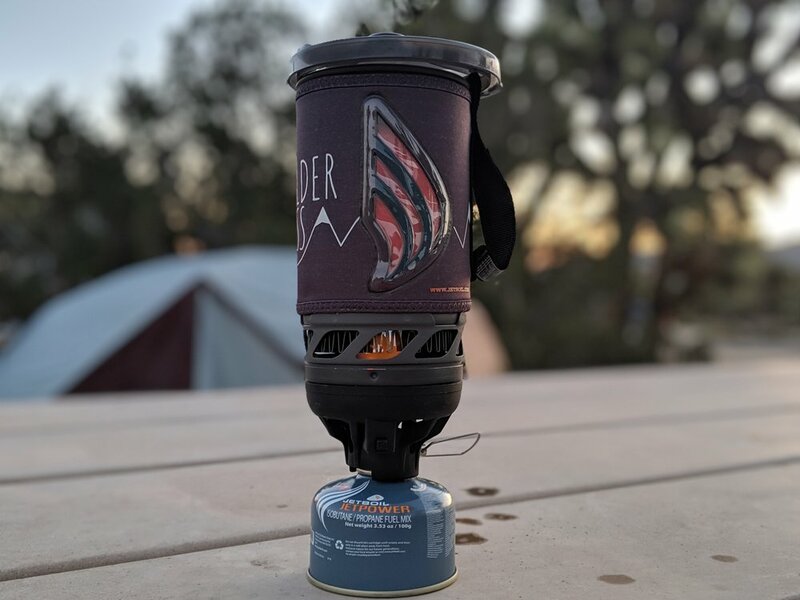 After developing a list of the top 18 hiking camp stoves, we narrowed the list for this story to the most popular and highly rated upright canister stoves and integrated stoves (like the Jetboil). While we believe alcohol stoves and alternative fuel stoves can be good options for some people, for this story, we wanted to compare backpacking stoves that are similar. We plan to write a story on alternative fuel stoves in the future. To identify the eleven contenders, we prioritized backpacking stoves that consistently got high reviews from multiple trusted sources as well as high customer reviews. We did not include the decades-favorites MSR Whisperlite because we believe there are lighter, faster, less bulky options available. We’ve owned the MSR Whisperlite for almost two decades. It’s great for guides because it’s easy to fix and some models can handle any kind of fuel. But the Whisperlite has a steep learning curve. It used to be the standard, but we don’t think the MSR Whisperlite is the best option for most people anymore. The four integrated backpacking stove models we considered. Photo by Liz Thomas. For this story, we tested seven canister stoves and four integrated Jetboil-style stoves side-by-side on adventures in five states covering almost 1,500 miles of backpacking. We judged the backpacking stoves based on the criteria we determined were the most important to users. These criteria were developed by scanning common praise and complaints in customer and professional reviews. We also relied on our own extensive experience guiding and teaching backpackers about how to use gear. To see the Criteria, see our article on How to Choose a Backpacking Stove. Treeline Review co-founders Liz Thomas (left) and Naomi Hudetz (right) at Waterton Lakes in Glacier National Park on Day 1 of the Pacific Northwest Trail. Photo courtesy Naomi Hudetz. -Pacific Northwest Trail (1200 miles from Glacier National Park in Montana to Olympic National Park in Washington across alpine zones, montane forests, temperate rain forests, and the rocky coast). Read the directions. Read the directions. Read the directions. And by directions, we mean the ones that comes with your new stove. Reading this story doesn’t count. Stoves can be dangerous. They can explode if used incorrectly. They can cause horrible skin burns, wildfires, or worse. This is not an gear item to mess around with or “wing it.” Treeline Review is not liable or responsible for you and your gear decisions. You are responsible for you. In some fire-prone states, operating a stove requires a permit. In some forest districts, especially in the wildfire-prone summer, all stove use may be banned. Check with the ranger of where you are hiking prior to going on your trip. Also, before you take your stove outdoors, you will need a cookpot and/or other cookware. We go into deal about how to choose a cookset in our article How to Choose a Backpacking Stove. Minimize the impact of cooking by choosing a spot with mineral soil (no leaves or duff). Level it with your hand and create at least a 5 feet buffer free of plant material on all sides around your stove. Ideally use sterile, sandy soil. Avoid cooking directly on sandstone, as the heat can permanently burn and scar the rock. Always have some extra water on hand in case you need to dowse a fire that escapes. The best video I’ve seen on how to keep your campfire spot safe is the one you’re required to watch to get your California fire permit (watch it at the top of this section!). For those using their stove in California, you are required to obtain a free fire permit (even for a campstove). I wish all governmental processes were as easy as they make getting this permit: watch a 2 minute YouTube video, fill out a 5-question survey, print it out. Even if your stove comes with a Piezo igniter, you’ll want to know how to light your stove with a lighter. To save weight, we carry a Mini Bic Lighter (or two; ways to start fire are one of items that even ultralighters will seek redundancy). I always buy them in bright colors (harder to lose). Don’t store the Mini Bic in your pot, though. They’ll stop working when exposed to moisture. Prior to lighting, screw your stove onto your canister all the way (read the directions). Turn your gas valve. Then use your lighter to gently and carefully hold a flame to the gas until it lights. Read the directions that come with your stove before doing this. To prevent burns when lighting, we’ve used this trick from Mike Clelland’s Ultralight Backpacking Tips for years: strike your Mini Bic with your pointer finger, not your thumb like you would for a cigarette. It gives you more dexterity when trying to get in there with all those small parts. Watch your sleeves when lighting your stove. Thin material, especially that of wind shirts, is quite susceptible to melting if it comes anywhere close to a flame. Windscreen: Most manufacturers will tell you never to use a windscreen when using a canister stove. Wind can impact your stove’s fuel efficiency and cook time, though. Look for natural windscreens by setting your stove up behind a rock (try not to move any natural material, though--move yourself and your unlighted stove if necessary). For the most fuel efficient cooking, run your stove at medium heat, not high heat. For maximum efficiency, always use your lid. If you don’t want to carry the extra weight of a lid, fold aluminum foil or a cut up aluminum pie tin over the top of your pot. For integrated stove systems, make sure your lid is really snapped on there. If it is, you can pour hot water out of the spout just like a kettle or strain the contents to keep noodles. You can use (or reuse!) mylar cooking bags from freeze-dried meals to rehydrate your food. That means your cooking pot always stays clean. Photo courtesy Liz Thomas. Washing dishes is the worst, but it doesn’t have to be. Scrape your pot free of food as much as you can before washing. Then, collect some water and take your dirty pot at least 200 feet away from a creek or lake. Rub the interior of your pot with fingers and the water, scattering the grey water (dirty dish water) in multiple places so as not to attract animals to one smelly place. Sand can get burnt bits off the bottom. Check Leave No Trace to learn more. Some backpackers, myself included, prefer to use their pot only for boiling water. Then, we dump hot water into a disposable bag filled with dehydrated food. Note this system creates more trash and can be smelly. But it’s definitely a time efficient lazy way to do things. When cooking with groups, avoid putting oily or cheesy things in the group pot (keep that in your personal pot). This will cut down on the dishes you’ll need to do afterwards. We went through a lot of canisters in the testing of these stoves. This is a photo of a side-by-side comparison test in the snow. Yes, we know that the comparison of speed and efficiency can’t truly be measured using different pots and different canisters. Instead, we are testing ease of use. Photo by Liz Thomas. Can I recycle used fuel canisters and butane canisters? Like you, one of our concerns about canister stoves over other fuel types is the guilt associated with throwing out metal. We were thrilled to discover that there is a canister stove recycling tool available, but found some fine print. Some municipal recycling centers can accept a crushed fuel canister, but not a full fuel canister. This is their way of making sure that they are getting relatively clean metal instead of a exploding fuel can. Thus, it is essential to crush canister stoves before recycling. The fine print? Many smaller and rural area municipalities aren’t able to take crushed fuel canisters. In that case, your only option is to throw that metal in the trash. Still, even if you can’t recycle your canister, trash services prefer crushed cans to ensure that there is no remaining flammable material alongside other trash. A vented can free of fuel is preferable to a non-crushed can regardless of where it goes after you’re done with it. The canister crushing tool can be brought directly to campgrounds or backpacked in. Photo courtesy Liz Thomas. To use the canister stove crushing tool, first make sure that your can is totally empty before attempting. It can be dangerous to pierce if there’s gas still inside. Read directions before you attempt this. The tool carefully punctures empty isobutane fuel canisters. It releases any remaining fumes into the air (make sure to do this process outside and somewhere well-ventilated). Alternatively, you could use a hammer and screwdriver, but the canister stove tool is easier to use. When you get the canister stove crushing tool, it comes with plastic to protect the point while in transit. Remove the plastic when you get home to pierce your empty can. Multiple customers attempted to pierce a fuel canister with the plastic point and complained that it wasn’t sharp enough.The plastic is not the point, but instead a protective cover to the metal. The metal piercermakes a small puncture to release gas, not a giant pokey hole in the metal. Once you remove the plastic protective cover for use the first time, you can’t get it to stay on easily. So if you’re backpacking with the canister stove crusher, be careful to not let the sharp part of the tool pierce your other gear. If you want to celebrate your mini-environmental victory, the canister stove crusher also doubles as a beer opener.